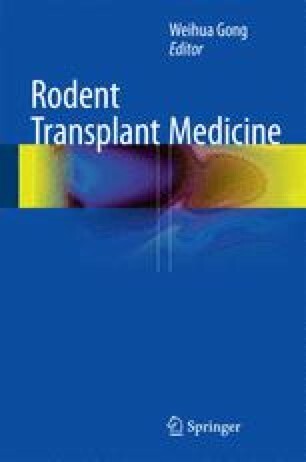 Rat orthotopic liver transplantation (OLT) has been generally accepted as a studies model in the research of organ preservation, transplant pathology, physiology, and immunology since it was firstly developed by Dr. Sun Lee et al. (1973). In 1979, Kamada and Calne reported “two-cuff technique” for portal vein and infrahepatic vena cava (Kamada and Calne 1979), which significantly shortened anhepatic phase to 15–20 min and increased 1-week survival rates to 70 %. Afterward, their successful techniques have become widely used in practice (Hori et al. 2010). Herein, we present the detailed surgical procedures for a rat model of OLT with “two-cuff technique” and without hepatic arterial reconstruction.